This post is sponsored by Elmer’s. All opinions are my own. I have taken the pledge – The Lets Bond pledge with Elmer’s! Taking the time to create crafts with your children helps them grow. They learn hand-eye coordination, create/recognize patterns and it develops their attention span on a specific project. The number one item, to me, is nurturing your child’s imagination and creativity. This is why I took the pledge. To learn more, please visit Elmer’s and read the research that has been collected. Crafting with my son is a time we can share together. Since his little brother came along in February of this year, he has had to learn to share Mom. This is a great way for us to do something together and have fun. 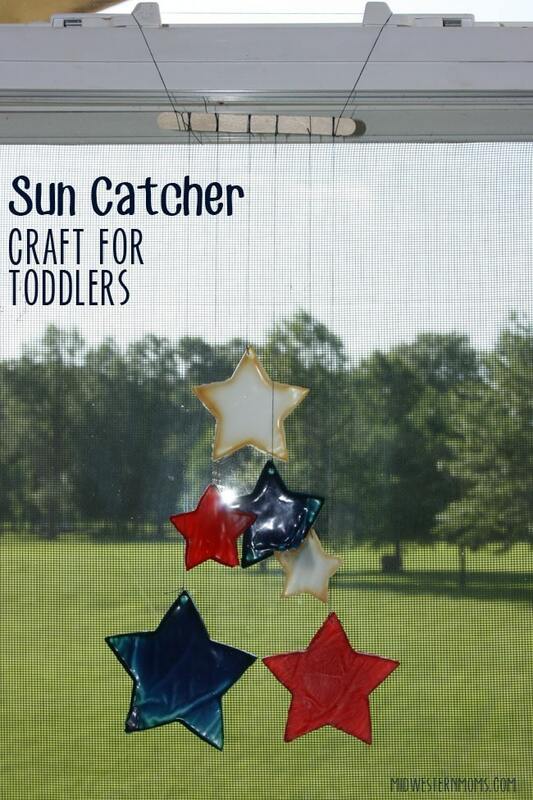 When I picked out this sun catcher craft, I knew he would have fun squirting the glue into the molds. He was very patient and waited for the glue to dry. Since it took several days, he would check on the stars daily and multiple times a day. Sometimes, it was hard to keep his little fingers out of the glue while it dried, but that is a boy for you. 1. First thing I did was cover a cookie sheet with wax paper. I taped this down with scotch tape so it would not move. 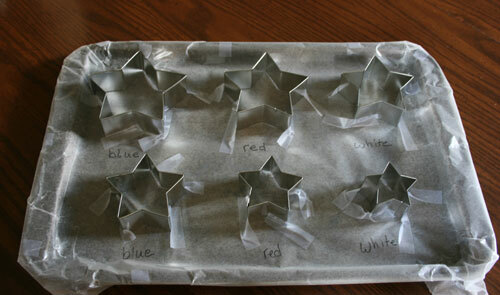 Then, I placed the star cookie cutters on the cookie sheet and taped them down as well. This will help them from moving around as well. Optional: I wrote the colors under each star. My son is currently learning to read and this allowed him to read what color each star should be. 2. 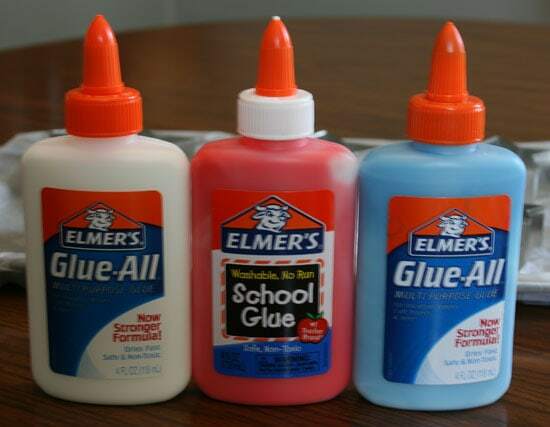 Take one of the bottles of Elmer’s glue and add the blue food coloring to it. I used a bamboo skewer to help stir the coloring into the glue. You may have to shake the bottle as well to help the color reach all of the glue inside the bottle. Do the same with the red. I found that the glue will dry darker than what you mixed up. Just make sure to add enough red so you don’t end up with pink. You will see below that I used two different types of Elmer’s. They both worked great and you can use your preference. 3. Now for the fun part! 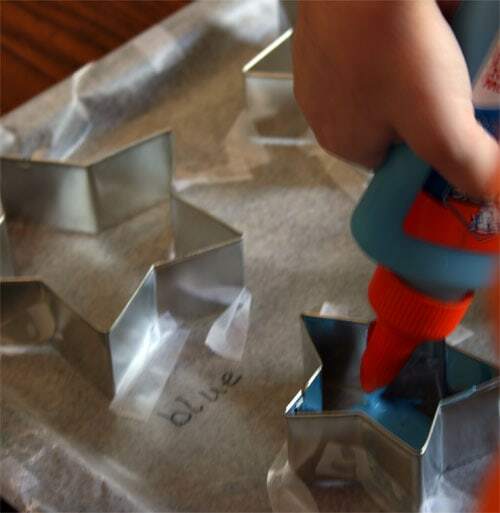 Let your toddler squeeze out glue into the cookie cutters. Make sure you end up with a thick amount of glue inside the cookie cutters. If you don’t, they will dry brittle and will break when you try and remove the stars. Don’t worry if you have any glue run out. It easily trims off. 4. Now, we wait…..several days. It will take several days for the glue to dry. As I stated before, my son loved checking on the stars. 5. When the glue is dry, it will feel a bit rubbery. It is time to remove the stars from the wax paper. Just peel up the tape and rip the stars off the paper. You will more than likely have to peel bits of the wax paper off the back of the stars. If you can’t it all off, that is okay. I took a knife to help dislodge the stars from the cookie cutters. Then, I used fingernail clippers to help trim up the stars. 6. Since the stars are rubbery, it is easy to take a needle and make a hole in the stars for the thread. Once the hole is made, tie one end of the thread around the star and the other end to the popsicle stick. Play around with the lengths of thread. 7. Create a loop by tying a bit of string to each end of the popsicle stick. 8. 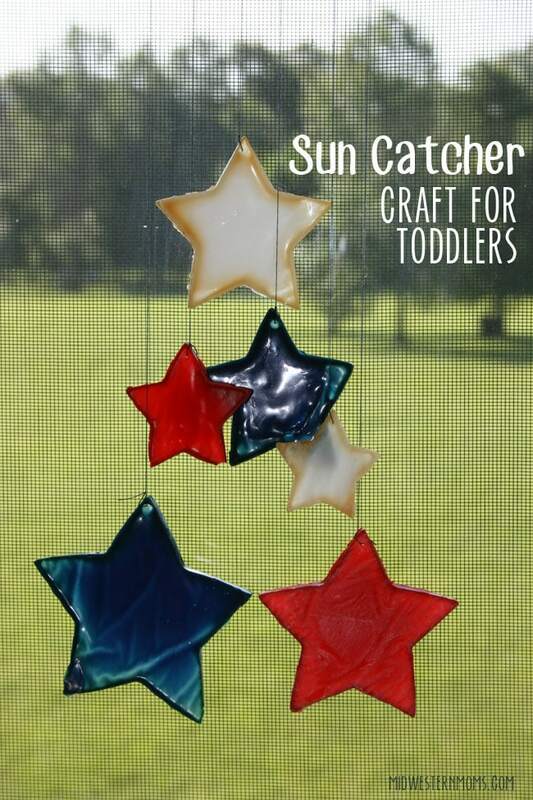 Hang your sun catcher in a window that you and your toddler will see every day. My son loves seeing the sun catcher that we created. It hangs where he can see it and remember the fun we had creating it. Have you taken the Let’s Bond Pledge? What crafts do you have planned this summer? These are so cute! 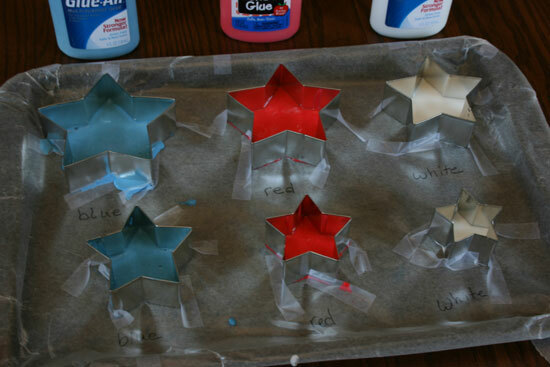 They look so easy to do, and are great for 4th of July decorations. Thanks for sharing! Such a darling idea! And, so easy. Pinned! Another one for the pintrest board! I think even my older kids would like this. This is so cute! I have a toddler and we are definitely trying this. He will love it! Stopping by from the SITS Girls Facebook link-up. Just love easy craft projects! Thanks for the inspiration! I love a craft I can do with my almost 5 and 2 year olds. It is so hard to find things appropriate for both of them. Love this!